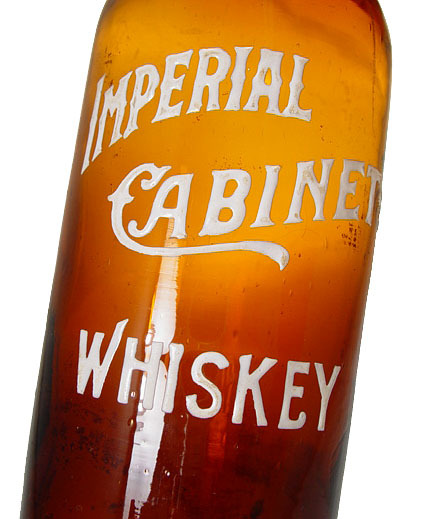 These interesting bottles are known by collectors as the odd sized whiskey shaped amber bottle but mostly they are the antique bottle with the Sphinx on it. Collectors of western bitters and bottles in general are always on the lookout for picture whiskeys and although we’ve seen race horses, eagles, a Phoenix and deer and elk heads, along with a lot, lot more, to our knowledge this is the only western made bitters made with a picture of a Sphinx prominently displayed front and center on the bottle. To be fair, it is technically a Sphinx as we think of them primarily because of the Sphinx of Giza which is the body of a human and the head of a lion. However that Sphinx does not have a pair of wings. For that version we turn to the Greek interpretation which by all accounts is often depicted with, you guessed it, a pair of wings along with the face and body of a woman. The Sphinx of Giza is not thought of in Egypt at least, as a playful lion cub with a man’s body but rather a mythicized beast of a creature not to be toyed with. In Egypt, this limestone monument is referred to as The Terrifying One; literally: Father of Dread. Built all the way back to at least 2500 BC and often claimed to be even older, it is the oldest monument in Egypt and was made long before the pyramids surrounding it in the Valley of the Kings. Anyway, enough on the Sphinx itself, and we haven’t even gotten to the fact that the one shown on the bottle is holding a wine glass of Miller’s Ratafia it is drinking no doubt on a hot Egypt day. 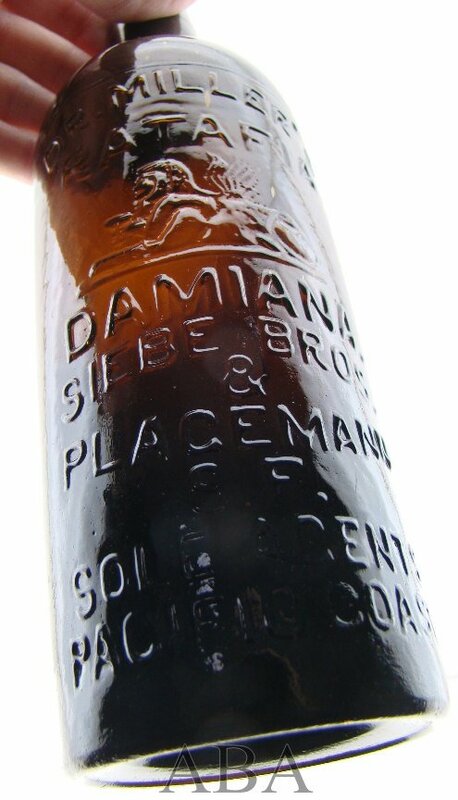 By now most bottle collectors know that damiana was thought of as a powerful aphrodisiac and they weren’t alone in using it in their bitters and other concoctions. The Baja Bitters are probably the most successful of the damiana bitters but there are numerous choices out there. As a result the Siebe brothers apparently thought it a good idea or they just happened to wander in that direction. What could be better than a Sphinx and an aphrodisiac? The Miller’s Ratafia were made, according to Thomas and Zumwalt, from around 1878 or 89 to 1982 according to Thomas and for only the year or two according to Zumwalt. According to Thomas the earliest known address for the Siebe brothers was on the southwest corner of Pacific and Stockton Streets in San Francisco in 1859. Later the store became the property of just John Siebe and moved to Union and Powell Streets. Eventually John got back together with his brother and they opened a grocery liquor store around 1866. The point is that it would be 28 years from their first venture before the brothers and Plagemann would have a bottle with their names on it. We know the Siebe Bros. and Plagemann made their Rosedale O.K. Whiskey starting in 1882 and its possible Thomas just may have thought that the Miller’s product was made up to that date. While Thomas doesn’t get too much into the product itself it is one of just a couple bitters mentioned in his Spirits of the Old West book, the other the Chalmer’s Catawba Wine Bitters. Zumwalt points out that John Siebe and his brother Frederick had worked for G.W. 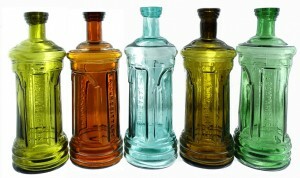 Chesley for several years and pursued a bitters product for their own. 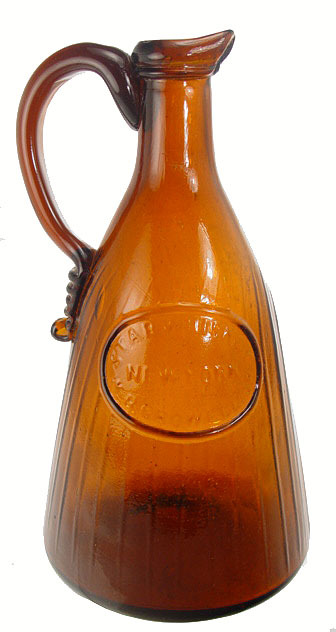 By 1877 they created their own wholesale liquor company while still working with Chesley, and decided they needed to furnish their own bitters product. 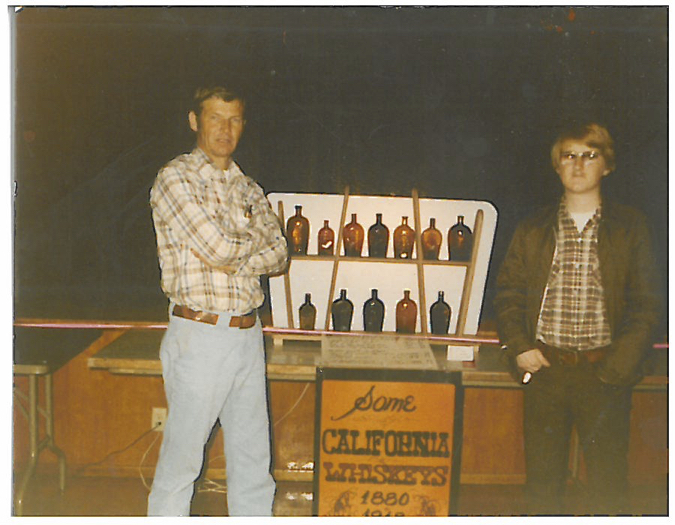 They met a Dr. Charles P. Miller who happened to be a noted physician in San Francisco at the time and hired him to concoct a bitters in which they could bottle and distribute with their name and included J.F. Plagemann who had become a partner in 1878. 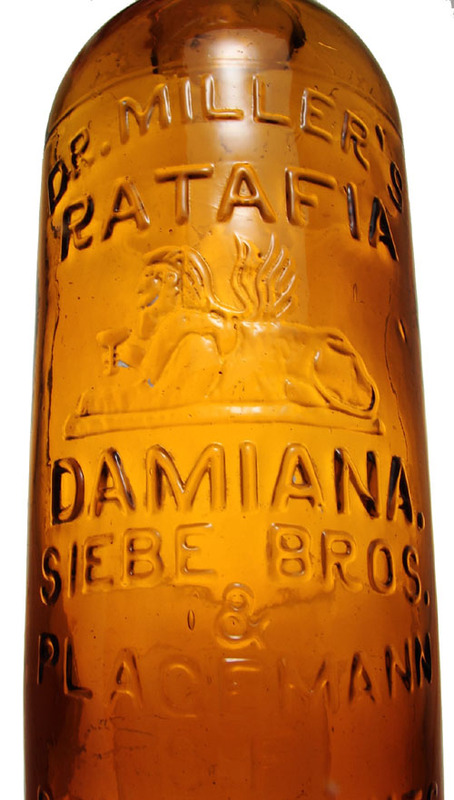 Can you imagine the looks on their faces when they were first introduced to the Miller’s Ratafia bottle? Few moments can be as rewarding to a wholesale liquor dealer than to see your name in glass on the fruits of one’s labor, especially after 28 years of hard work. The brothers worked together until 1920 with prohibition in full swing. The company was said to be worth $125,000 to $200,000 by that time. By the few bottles out there owned by collectors today it seems the Siebe brothers were quick to cut their losses and went back to promoting a better known bitters in the Cundurango product already a familiar and popular drink. Their claim to fame probably came in the way of the Rosedale O.K. whiskey and their Ilvain, Golden Pearl, Old Family Bourbon and Marshall whiskey products. The Miller bottles come in a sixth size and are always shades of amber. They are one of the few bitters that read SOLE AGENTS PACIFIC COAST on them and one would have to believe that when the Siebe bros. and Plagemann came out with this design and contents they had to think they had a home run on their hands. An aphrodisiac bitters product with a sphinx? It had to be a huge success but unfortunately for some reason it wasn’t. It’s possible the bottles were too expensive and continued with a paper label. They are believed to be found in shades of light yellow and yellow green. We have also seen them in a dark chocolate amber and although the number of examples known are probably in the 5-10 range, they do come in various shades and are often pretty crude. The number known is believed to be examples that are undamaged. The one pictured in the Zumwalt bitters book was previously owned by the author and had a new top from mid-neck up. We had another sent to us years ago in an orange amber that arrived in around 30 pieces. A lesson that you can’t put a bottle in a shoe box with tissue paper and expect it to arrive in good shape. These hard to find western bitters have been mostly dug in California, Vallejo, Mariposa and Nevada City and in neighboring states including Nevada. We don’t often hear much about a Miller’s Ratafia changing hands, we believe that’s because there just aren’t enough to go around. Collectors who own one rarely want to part with them and new finds are quickly bought up. Since they are so hard to find collectors pay a premium and it appears the going price for an undamaged example in a decent color will sell in the $10,000 area. The bottle has a lot going for it in rarity of course but it’s a full face embossed western bitters, picture bitters at that and they usually come with a good amount of crudity and character. Whether the lofty asking price stays constant is anyone’s guess. It’s unlikely anyone will be offering one soon, of course the particular variant will always dictate price. 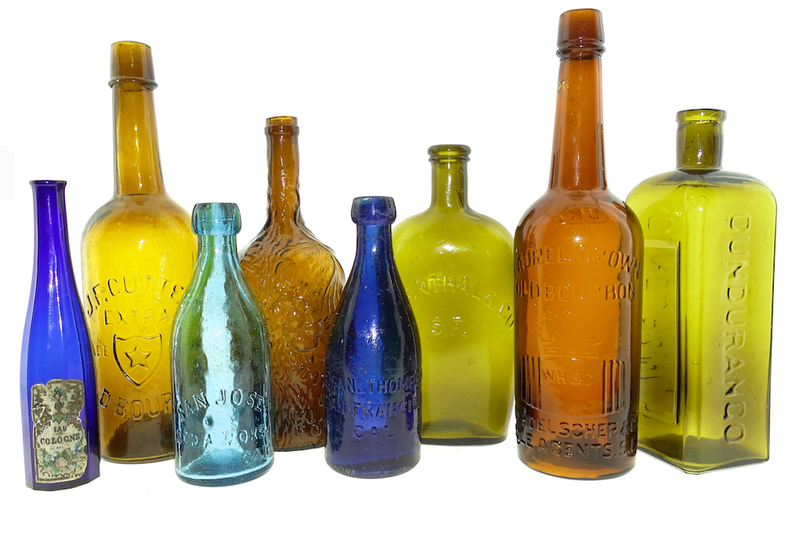 But we do know that when one considers the choices of different western bitters bottles out there, a top choice has to come in the way of a bottle with one of the most unusual decorations on the front and one that collectors rarely get a chance to see in person. That would be the mysterious and elusive Miller’s Ratafia. Just pulled from the ground.